It was Edition Records boss Dave Stapleton who suggested to Finnish pianist Alexi Tuomarila that he reform a quartet with Belgian saxophonist Nicolas Kummert with whom he burst onto the international jazz scene in the early 2000s. The new band, Drifter and this release of fluent, engaging contemporary jazz is a great result. The eight originals and a cover of Sting’s King Of Pain pull the listener in with atmospheric openings. There’s a cycling piano figure in the upper register or an expressively played neo – classical passage, a meditative rumble on the bass or firmly stated, march-like riff, but don’t be fooled. The band rocks out. Crow Hill develops a energetic groove and Tuomarila unwinds the first of a number of expansive solos before Kummert lets rip over a pulsing vamp. The Elegist develops a more even flowing feel, Kummert’s warm-with-a-keening-edge tone on tenor burnishing an elegant melodic theme. 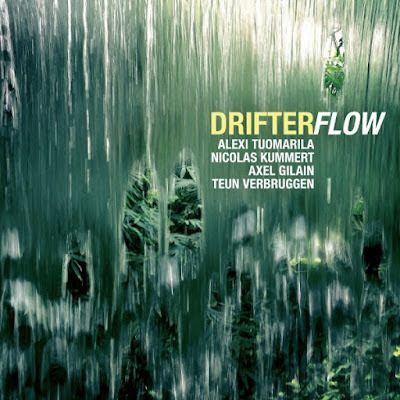 Closely locked in rhythmic pushes from Teun Verbruggen on drums and Axel Gilain on bass build momentum before first Kummert then Tuomarila again, really stretch out. It’s the story of the album. Engaging themes, deftly arranged pieces with varied sections, artfully constructed grooves and riffs made to fizz by Verbruggen and Gilain, but what really lifts it and guarantees repeat listens is the playing of the two co-leaders. Tuomarila can dazzle with extended, linear runs, a blur of notes fusing into melodic arcs, or dig in and groove, developing motifs and letting them grow. Then there’s lyrical melodic invention, decorating and embellishing the chant like vocal Kummert and Gilain supply on Lighthouse and Nothing Ever Lasts. He repeatedly sets this session alight. Kummert too packs a powerful emotional punch. He can burn, tracing zig-zagging lines over pumping vamps, match his co-leader for lyricism or conjure up lament like cries and swoops, building solos to an intense climax. Flow marks a re-union thanks to the prompting of Dave Stapleton, but also a confident, frequently powerful debut for a quartet that we can only hope we’ll hear more from.